After I had petitioned the Holy Son for 21 days saying, “In order to have the rock festival this October, we need rocks. Please give us a new rock,” the Holy Son gave us this rock as a gift in May 2012. It is a rock that has a mysterious male face on both the front and the back. It is a pair with the Great Stone Face (a 104-ton rock) which the Holy Son Rock has been placed next to. The Holy Son said, “In October, the rock festival will take place one again. This year, we should show something different, don’t you think?” So, I continuously prayed for 21 days and petitioned for a great and majestic rock that would astound people and that also contained a deep story. After receiving my instructions, Pastor Beom Seok told me that after he had detonated the dynamite in order to create a foundation for the Holy Son’s House of Love, he had tried to take out some of the big rocks, but since all the rocks were cracked in the process, it was impossible to lift them up in one piece. During the process, I also received a report saying there were no big rocks anywhere in Korea. When I prayed thinking that it should not be like this, I received inspiration. As I prayed, I kept thinking back to a big rock next to the Myeongmak-gol valley road. I prayed while thinking to myself that I should ask Pastor Beom Seok about it. In the end, I decided to ask him, but my heart was left anxious because no rocks could be found. Pastor Beom Seok also kept thinking about the rock even while he was working, and he told the workers to be alert as well and on their best behavior. On the 21st day after I had begun to pray about the upcoming rock festival, I received a letter from Pastor Beom Seok. It was a report about many things, but one thing shocked me. Pastor Beom Seok saw a rock in the middle of the rice paddy near the spoil where they had been dumping the dirt they had excavated to build the foundation for the Holy Son’s House of Love. Thinking about the rock that I had told him about, he felt that this rock looked too precious to bury, so he and the other workers dug it out. As a result, a rock bigger than the Great Stone Face was discovered, so he sent me pictures. The Holy Son made me pray and tell Him that I was looking for a big rock, and the Holy Son made Pastor Beom Seok dig out the rock from the rice paddy that he had been seeing every day since the beginning of the construction of the Holy Son’s House of Love. After digging out the rock, everyone was surprised that it weighted 130 tons! The problem was moving this rock to Wolmyeongdong. Pastor Beom Seok sent me a report with pictures saying it would cost too much money to bring it into the Holy Land because it was unexpectedly large. After receiving the letter, I immediately thought, “I prayed to the Lord to give me a new rock, and this is it! Hallelujah! The Lord said this morning, ‘It is a new work, a new event,’ and this is it!” Since it felt like this was something the Holy Son wanted me to realize, I immediately checked with the Holy Son about it. When I looked carefully at the photos of the rock that they had excavated, I realized that it was the rock I used to climb up on during my teens and twenties. I used to pick the rock herbs that grew on the surface of the rock every year. The rock herbs that grew on this rock were thick and big, like the rock itself, so they looked nice and pretty. They were also tasty. Before this rock had been dug up, it seemed like a small rock from the surface, so they did not want to dig it up, thinking that it was obviously small. However, after I showed the Holy Son how much I wanted a new rock, He inspired Pastor Beomseok and the other workers to excavate it. After excavating the rock, they realized that it was a really gigantic rock. It was a whopping 130 tons, which is equivalent to the weight of 130 medium-sized cars! So we were able to move it easily in the end. It was easy because it was the Will. The Lord made the person of mission pray and revealed the Will to him. There are various kinds of treasures buried in your heart. If you pray, God makes you dig them out. 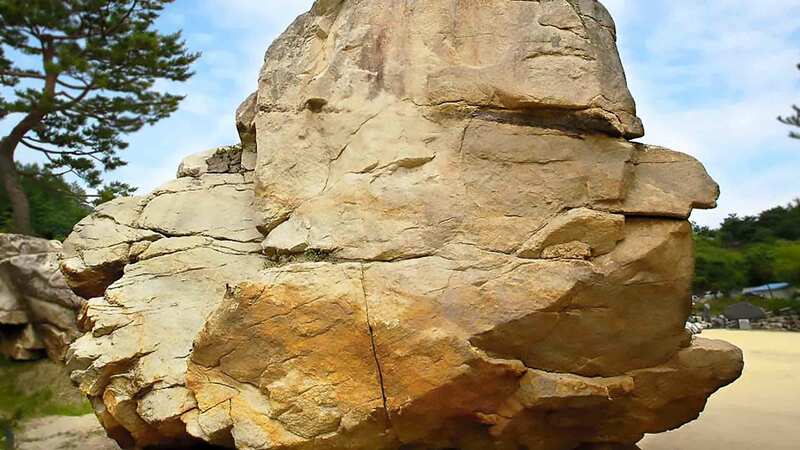 When I looked at the picture of the boulder again after having listened to the Lord’s Word, I saw the mysterious face of a man on the front and on the back. After digging up the Holy Son Rock, I gave thanks to the Holy Son without sleeping for three days. I exclaimed that this was a rock that would have been buried in the ground, and I was so thankful that He had let us find this rock because I had prayed. I realized that, in this way, I also must pray for lives. Then, they will not be buried in the world but be called to God’s Providence. After we had moved the rock into Wolmyeongdong, I looked at it and saw that it had an image like that of a person and an image like the face of a divine being, so I decided to name this rock, which symbolizes the Holy Son, “the Holy Son Rock.” The Lord gave us the Great Stone Face to symbolize the Lord, and during the period of the Holy Son Prayer, as a gift, the Holy Son gave us a rock that symbolizes Him. Since I received this rock after praying for 21 days, I am now praying while petitioning the Holy Son to give us a rock that symbolizes God. Since He has already given us a rock that symbolizes the Holy Spirit, I prayed for a few days saying that it would be nice to receive a rock that symbolizes God. I received a discreet inspiration in my heart that He would give it to us. During the same predawn hours He gave me that inspiration, I prayed while wondering whether another rock had been discovered after the Holy Son Rock had been dug up from the rice paddy in Myeongmak-gol. “Rocks with shapes and forms catch people’s eyes, become topics of conversation, are valuable, and usually contain stories. In the same way, the more human beings receive My the Holy Son’s heart and resemble My heart, mind, and deeds, the more they will become valuable people for the eternity that is to come. When people live their lives on the earth with their hearts, minds, and deeds resembling God’s, they will be used in an irreplaceable way, and their spirits will achieve a heavenly form and will go to Heaven accordingly. When it comes to rocks, the more they resemble a certain form, the more wondrous and valuable they are. In this way, people need to resemble the Holy Trinity’s heart, mind, character, and deeds by looking at the Lord. Only then will their value soar up to the heavens. On the other hand, if you accept the words of Satan and demons, wicked people or slanderers, and you come to resemble their hearts, minds, thoughts, and deeds, then you will be judged no matter what, and both your body and spirit will come to ruin. That predawn, while we was praying the Last Opportunity Prayer, I fell into a trance-like state and saw a vision in which a man told me that he had a gift for me. There were two gifts. The man kept smiling and said that he would keep it for himself. I kept pestering the man to give me the ring. In the end, because I kept begging him, he gave me the ring. After receiving the ring, it seemed as if the pearl on the ring sparkled more than the ring itself. After waking up from the dream and praying, the Lord told me that He would give me another rock. Just like the man who seemed like he was not going to give me the ring but gave it to me because I pestered him, even though in the beginning He was not going to give it to me, the Holy Son gave me another rock. He said, “There will be another rock discovered while the workers are working in Wolmyeongdong.” Because I had realized in this way, I continued to pray and told Pastor Beom Seok to dig out more of the landfill. That same day, in the morning of the day I received that dream revelation during the predawn hours, I received pictures of two rocks that had been dug out. One of the rocks did not have any image, but the other one had an image which somewhat resembled a person. Like a pearl, the imageless rock was a natural rock which weighed a lot rather than having a special shape. I had told Pastor Beom Seok that there would be another rock at the place where he had dug out the Holy Son Rock, so before filling that area up with dirt, I had told him to dig up more places near that spot. When Pastor Beom Seok and the other workers had dug out the surrounding spots, they found these two rocks and took some pictures and sent them to me. The rock without an image weighed 50 tons. Being reminded of the fact that I had received a watch and a ring in my dream in the predawn, I realized: “The ring that was given to me as a gift because I pestered the man is these two rocks!” I asked the Lord whether I was right. He told me that I was correct. The Lord had appeared symbolically in my dream as the man who had given me the gifts. The watch represented the Holy Son rock. The rock is amber and has a part that is yellow like the watch in my dream. After receiving the Holy Son Rock as a gift, I prayed and petitioned the Lord for three days for a rock with a form that looked even better than the one we had already unearthed. As a result of that prayer condition, the Lord gave us one more rock. If that rock had been left alone in the rice paddy without being excavated, it would have become a burden to us later, so it would have been buried under with dirt. If I did not pray, He would not have given it to me. You must pray. Then, you will be able to do new work, whether big or small, and when you do the new work, do not wait, but pray. When you pray, an event of loving the Holy Son happens. This pertains to all of Providence. Since this was during the time of the Holy Son Prayer, we held an event in Providence together with the Lord. If we did not have such an event, then we would not be able to have any fun with the person whom we love. We need to pray often and petition the Holy Son to hold new events of love. Before we carry out a new event, the first thing that we must do is the event of prayer. It is the event of praying to the Holy Son. Not only must individuals have new events but also churches and departments. I am not saying that you should always hold a festival, but you should hold an event that is meaningful and something that everyone can do. It must be an event for you yourself, for Providence, for the Holy Son, and for God. From 60 years ago, the Holy Son had already planned to make me build stories with this rock by making me pick the rock herbs on it as I climbed up and down this boulder, which was also next to the path on my way to my relative’s house. He did this so that this rock would be put in Wolmyeongdong after we had built the Natural Temple and after the right conditions were met. After we put it in Wolmyeongdong, He reminded me of my past and allowed me to share the stories with you. God’s design is amazing. It is astounding. The Holy Son, the Almighty One, walks among people and works in all situations. The Holy Son Rock is evidence of this. It is a boulder that symbolizes this truth. Even if another rock were to be brought from elsewhere in Korea and even if we were to name it “the Holy Son rock,” it would not have the same story and value as this one. This rock is a treasure that contains a deep meaning, a deep story, and a deep Will. Since it is a rock that involves the Heavens and has a history with me, it is a treasure that is more valuable and meaningful than any other rock in the world, and its story will be a topic of conversation for many years to come. Just as rocks contain stories and a purpose, people who have come to God’s Providence in this time period also have stories and an individual Will for them. Since God, the Holy SOn, and the Holy Spirit raised you and built stories with you from the time you were born and then brought all of you here like me, thank Them with all of your heart, will, and life. You were chosen because They cherished the stories They have made with you. Testify about your stories and evangelize. Also, testify about the Lord who is the body of God and make many lives return to Him. The core of a counterpart is only true love. A story with the Lord is essential to your life. No matter how beautiful the shape and image of something may be, if its story does not amount to much, then it has little value, it is less moving, and it does not teach very much. Say God and the Lord gave something to you. They give things to you according to your story, but the type of story you have with Them is more important than what they have given you. They could give you something because you loved them, give you something to reward you for your hard work, or give you something to commemorate something. Each situation is different. Each story is made according to how each individual interacts with the Trinity.